will be able to carry out more active tasks in your workplace and thereby enhance your employability. The WorkHopper will increase your freedom of movement considerably. But that’s not all. Thanks to the WorkHopper, you will still have plenty of energy to spare at the end of the day. The WorkHopper can support your body according to your preference. The WorkHopper offers you the possibility to constantly vary your sitting posture as opposed to remaining in a fixed sitting positition. You can also adjust the WorkHopper at your workplace to help you carry out your tasks in the best possible way. The excellent shock absorption enables you to move around the factory, warehouse or office comfortably and without pain. The back and sitting angle adjustment allows you to carry out every task in a position that is comfortable for you. 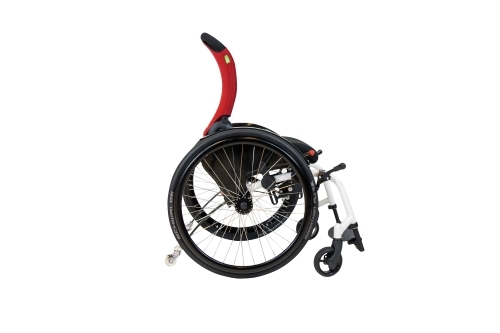 The WorkHopper is the most energy-efficient occupational wheelchair in its class and will leave you with more energy for other activities. Because the wheelchair is made from a 3D body scan, it fits your specific body measurements precisely. The integrated rollover protection guarantees your safety.